It has been a good winter of training (for me) as I did not gain any significant weight, nor did I get too far out of shape! I also did a few stair climbs – Chicago’s Willis Tower, The Empire State Building and Run the Republic in Denver. I had a good result at Chicago, despite feeling a bit “off”, which is a drag because when you are “off” in a 15 minute race, that makes it really painful. The result at Empire was not great, but I felt REALLY good! I got clogged up at the start, but once I broke free, I was on fire – so that is nice – maybe all of that excruciatingly painful training paid off. At Denver the result was good, but from a pain stand point, it was worse than Chicago. Fortunately it was only half as long – so the suffering was almost manageable. As it turns out, I had pneumonia – and probably had been harboring it for a few weeks. And here I just thought I was over trained and burnt out. Lesson to self: Listen to the body!! Second lesson to self: Even though the race is in your own backyard doesn’t mean you have to race. Maybe some day I will learn these lessons. In the mean time, a month of rest and I am as good as new (or as good as you can be at 46). So, enough about my racing, now I want to touch on strength training. My friend, Art Thompson, has been very patiently waiting for me to clarify some of my ideas about strength training for triathlon. I have been thinking a lot about this, as the article that I wrote for the coaching manual is about 10 years old (see Team USA Strength Training Program and other links below) and I wonder if it is still relevant. If I look at that article and apply it to training and racing – this is what I would do (and used to do): Just like any training, it is important to figure out your A race/races of the year and be sure that you are done with the complex lifting at least 3 weeks prior to the race. I would then work backwards – 3 weeks of complex training, 2-3 weeks of super set training, 4 weeks of basic strength, and 4 weeks of hypertrophy at the very beginning. So, a total of about 12-14 weeks BEFORE the 3 weeks prior to your A race. This assumes that you are already strong from a strength training plan, if not, you will want to add an additional 4+ weeks getting ready to lift heavy. I used to do the hypertrophy training during my “base training”, then move to basic strength training as my triathlon training turned to strength. As I moved into racing season, I moved to the super sets and then finally to the complex training, as I approached my A race/races. I would not be overly rigid, though, as I think the main things to focus on when strength training are variety of exercise and consistency. More and more I am thinking that strict training phases might not be the best way to go. Maybe I just think that way because I get bored doing a purely base or strength phase? I don’t know, I have not really kept up with most of the current training ideas, but I think mixing things up is a good way to go. My advice with strength training? Unless you have an insane amount of time to train (or your family doesn’t care if they ever see you), you might think about just doing your strength training as you train! I know I talked about this at the clinic last year, but triathlon is swimming, cycling, and running. I have yet to see a race that incorporates a weight lifting segment So, obviously to train appropriately for a triathlon, you already need to train quite a bit in each discipline. 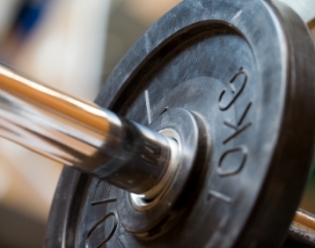 How do you incorporate strength into workouts? Paddles in the swim a few times a week are a good option for the swim. Running or cycling hills are a good option for the run and bike. Mix up the repeats and keep true to the essence of your workout for the day. For example, if you are planning on doing a strength endurance ride, then your hill repeats might be 10+ minutes in a heavy gear with a slower cadence (60ish rpms). If you are looking for more of an explosive hill work out, then you would do shorter repeats with a higher cadence. Personally, I like the gym, so I fit it in 2-3 times a week – probably to the detriment of one of the other disciplines, since I have limited time to train. But, for me, this is about enjoyment, not just results. I do, though, keep the sessions short – 45-60 minutes tops. They are also more of a circuit, and the exercises are always different. I hope this somewhat clarifies the article that I had written on strength training. Happy training – the weather is getting nice – get outside and enjoy! Thanks very much for the post. It certainly helps clarify a few things and goes a ways to combat the dreaded guilt factor of not getting all those residual sessions in! Personally, I really enjoyed strength training this off-season and into the base portion but as things have ramped up, it’s difficult to get the extra time in the gym and concentrating on strength session on the bike, in the pool or on the run mixes up the training!